Sometimes old recipes just pop into my head. I’ve been cooking and baking a long time and many of the recipes I used in the beginning of my journey have fallen by the wayside. Things that once seemed complicated that are now too easy, or things that just didn’t turn out at all. I would guess the first time I made these brownies was about 12 years ago. My friends tease me that I have an amazing memory for dates and I have to say that it’s true. I just remember what was going on in my life and can attach the year and time of year to it. In this case, I was married to my first husband (we split in 1999) and we were heading off for a camping trip with some friends. If I was camping in the Seattle area, then it must have been July or August and I assume that it was 1997 because in the summer of 1996 we had just gotten married, and in the summer of 1998, things were already in a serious downward spiral. So there you go, 12 years ago. See how my brain works? Anyway, I think the brownies stuck out in my mind because a) they were really special (who doesn’t love biting into a brownie and finding a Reese’s peanut butter cup in there?) and b) things were already not feeling right in my marriage. I went with it for a while and then decided not to and we split. If I make it sound like it all was neat and tidy, please know that it was not. It was messy and heartbreaking but it is the 4th best thing that I have done in my adult life – the first being marrying Randy, the second being having my first son, and the third being having my second son. Got that? Since that time 12 years ago, I have made these brownies several times, but not recently. This was one of those recipes that just fell by the wayside as I got seduced by other bars involving chocolate. But I thought of them the other day when I got word that a good friend of mine had a baby girl. When both my boys were in their first few months of infancy, I absolutely had to have chocolate. Given my professed love for chocolate, this may not seem strange, but it wasn’t something I wanted. It was something I needed. 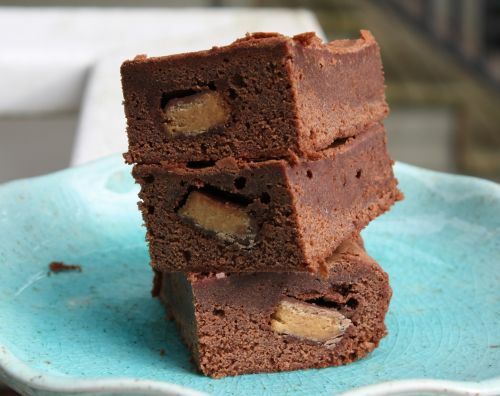 Brownies were the perfect thing for me because they packed a lot of chocolate into each bite and they could be held in my hand – something a nursing mother can appreciate. I decided to make these for my friend because she shares the need for chocolate when caring for a newborn. She also has two other little ones who I think will appreciate the Reese’s peanut butter cups. I was unable to find mini-Reese’s this time, so I just cut 4 full size ones into quarters. I cut my brownies larger and got 16 but you could cut them very small and get 24. 1. Position a rack in the center of the oven and preheat to 350 degrees. Line a 13-by-9 inch baking pan with aluminum foil so that the foil extends 2 inches beyond the long sides of the pan. 2. Melt the butter and chocolate in a double boiler, or in a heatproof bowl set over simmering water (be sure the bottom of the bowl doesn’t touch the water.) Cool until tepid. 3. In a medium bowl, using a wire whisk, beat the eggs until foamy. (DT: I used my mixer with the whisk attachment for this part.) Add the sugar and beat until blended. Add the cooled chocolate mixture and mix until smooth. Stir in the vanilla. Stir in the flour and salt until well combined. 4. Scrape half the batter into the prepared pan and smooth the top with a rubber spatula. Arrange the peanut butter cups evenly over the batter, in four rows of six cups each. Press down lightly on cups. Pour the remaining batter into the pan and carefully spread level over the peanut butter cups. Bake the brownies for 25-30 minutes, until a toothpick inserted in to the center comes out with a few moist crumbs clinging to it. 5. Cool the brownies completely in the pan set on a wire rack. Using the two ends of the foil as handles, lift the brownies out of the pan. Cover with plastic wrap and refrigerate at least four hour or overnight. Peanut butter and chocolate is a dangerous combination for me. Those brownies look great! 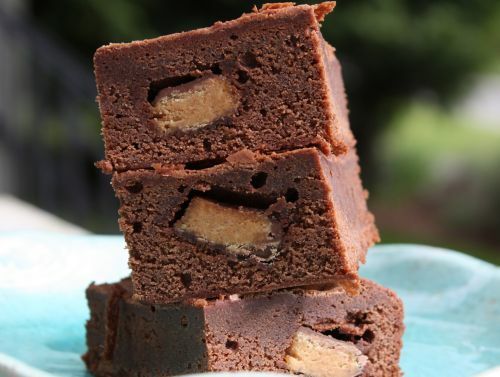 Wow, those Peanut Butter Cup Brownies look awesome. I bet they tasted great. I’ve never heard of that recipe before. I’m glad you’re digging into your old recipes. I love anything with PB & Chocolate. Hope you have more of these delactable, old recipes. 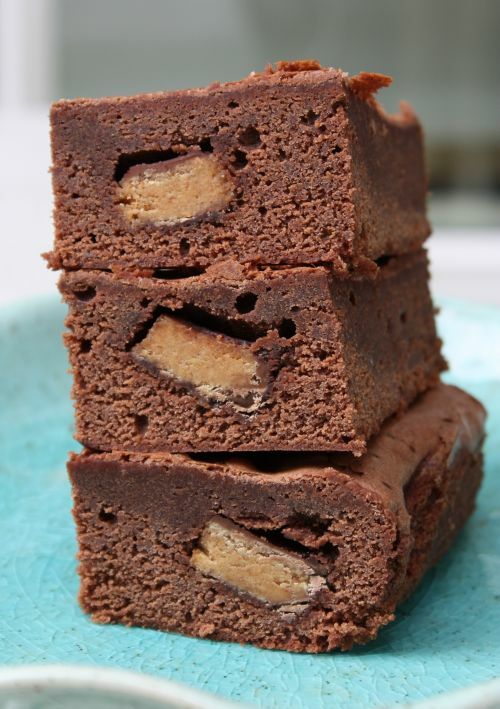 Wow, peanut cup brownie looks really great. It is such a classic. Nice pictures! Sign me up for PB and chocolate. I don’t have to be postpartum to need these! The idea of biting into a brownie with a surprise inside is tingling literally! Looks absolutely delish! Holy moly! I’m at a loss for words. Ill take an entire pan of those! YUM! Oh my. I think I’m going to make these. Soon. I can never say no to chocolate & peanut butter! I am totally digging this?Q? I had a recipe like this that I loved and have lost. This looks to be nearly the same;however,there was an additional chocolate sauce dribbled icing on the top. Do you have that recipe by any chance?